Top-ranking Obama administration officials, including the U.S. copyright czar, played an active role in secret negotiations between Hollywood, the recording industry and ISPs to disrupt internet access for users suspected of violating copyright law, according to internal White House e-mails. The e-mails, obtained via the Freedom of Information Act, (.pdf) show the administration’s cozy relationship with Hollywood and the music industry’s lobbying arms and its early support for the copyright-violation crackdown system publicly announced in July. One top official even used her personal e-mail account at least once in the course of communicating during the negotiations with executives and lobbyists from companies ranging from AT&T to Universal Music. Internet security and privacy researcher Christopher Soghoian obtained the e-mails via a government sunshine request for them filed in June, and provided them to Wired. The e-mails are embedded at the end of this story. The records show the government clearly had a voice in the closed-door negotiations, though it was not a signatory to the historic accord, which isn’t an actual government policy. The agreement includes participation by the U.S.’s largest consumer internet providers including AT&T, Cablevision, Comcast, Time Warner and Verizon. It requires internet service providers, for the first time, to punish residential internet-service customers who media companies suspect are violating copyright rules by downloading copyrighted movies or music from peer-to-peer networks. 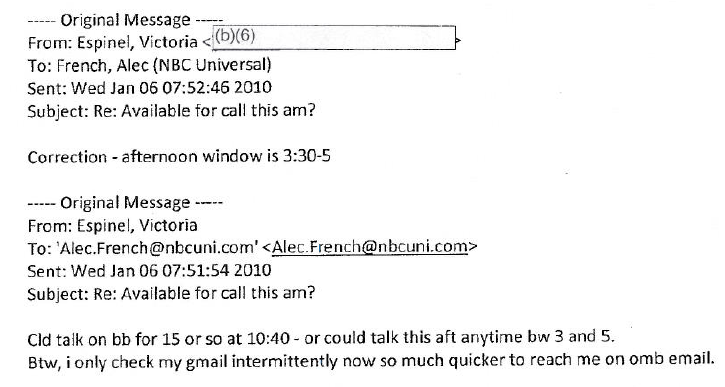 The e-mails do not entail much detail of the discussions between the administration and industry — as any substantive text in the e-mails (.pdf) was blacked out before being released to Soghoian. 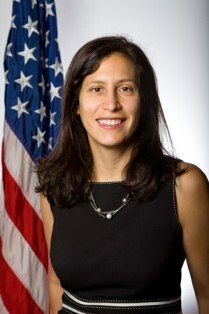 But the communications show that a wide range of officials — from Vice President Joe Biden’s deputy chief of staff Alan Hoffman, the Justice Department’s criminal chief Lanny Breuer to copyright czar Victoria Espinel — were in the loop well ahead of the accord’s unveiling. “These kind of backroom voluntary deals are quite scary, particularly because they are not subject to judicial review. I wanted to find out what role the White House has played in the negotiation, but unfortunately, the OMB (Office of Management and Budget) withheld key documents that would shed further light on it,” Soghoian said when asked why he sought the documents. He is appealing to OMB to disclose more e-mails. The e-mails, some of which had the subject line “counteroffer,” show off what seems to be a cordial and friendly two-way relationship between industry and the administration. She promptly replied: “Btw, i only check my gmail intermittently now so much quicker to reach me on omb email,” referrring to her work e-mail address provided by the Office of Management and Budget. She said she was available for the call. Her personal e-mail address was redacted in the documents. Espinel, whose position was created in 2008 as part of intellectual property reform legislation, declined in an e-mail to Wired to comment for this story. 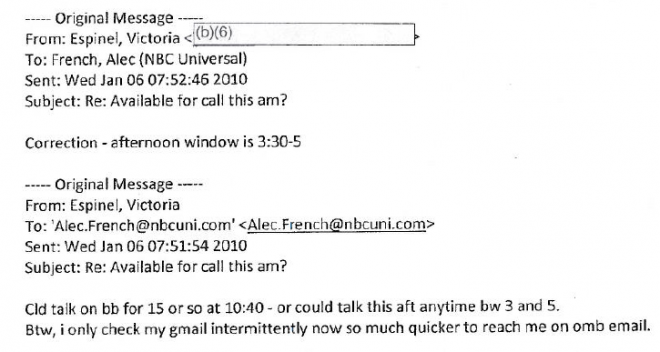 Instead, the President Barack Obama appointee referred Wired to the OMB press office. That office neither responded for comment nor replied to a follow-up e-mail. Neil Turkewitz, the Recording Industry Association of America vice president, routinely sent messages advocating stringent piracy crackdown measures to dozens of government officials from a wide range of agencies, including the Commerce, Treasury, State, Justice and Homeland Security departments. She adds: “I was at Brookings this morning and CDT came up to ask me to please not have the graduated response announcement be a complete surprise but to have some outreach to stakeholders in advance,” the e-mail to Sherman said. Months after the e-mail to Sherman, Espinel organized a meeting with CDT and Public Knowledge, another digital rights group. One of the required attendees was Aneesh Chopra, the government’s chief technology officer. “But we were not an integral part of the process,” he added. All the while, the administration was sensitive that the existence of the accord remain out of public purview. One e-mail showed that Biden’s office was concerned that CNET’s Greg Sandoval had broken the news of the deal weeks before it was publicly announced. All in all, the e-mails — which contain redacted draft copies of the deal marked “Privileged and Confidential” — show that the government was on top of the negotiations, and actively sought input from industry. “Ok – thanks. And look forward to hearing back from you on that,” Espinel wrote Lea. In August of last year, in an e-mail to Randal Milch, Verizon’s lead counsel, Espinel said she and Hoffman “were hoping we could meet sometime this week or next,” to discuss the plan. Espinel had organized a meeting last year between Hoffman, Sherman, herself, NBC general counsel Rick Cotton and Michael O’Leary, the Motion Picture Association of America’s top lobbyist, according to a September 2010 e-mail. Next to O’Leary’s name on the e-mail invite was “Today is his birthday” in parenthesis. Terms of the brokered deal include: On an internet subscriber’s first reported copyright offense, internet subscribers will receive an e-mail “alert” from their ISP saying the account “may have been” misused for online content theft. On the second reported offense, the alert might contain an “educational message” about the legalities of online file sharing. The content industry monitors peer-to-peer networks for infringement and informs ISPs of the IP addresses of alleged copyright scofflaws. ISPs then check which subscriber account the IP address was assigned to at the time of the alleged infringement and sends a notice of the allegation to the account holder. An internet subscriber could get such notices without having engaged in illegal downloading if others have used their connection or if the monitoring company makes a mistake. The RIAA, which includes Universal Music Group Recordings, Warner Music Group, Sony Music Entertainment and EMI Music North America, kicked off the negotiations with ISPs in December 2008, when it abruptly stopped a litigation campaign which included some 30,000 lawsuits targeting individual file sharers. The RIAA and the MPAA wanted ISPs to monitor Americans’ internet usage for copyright infringement, but the agreement does not include any provisions for that. One Turkewitz e-mail was addressed to about 50 government employees. It appeared to pirate a blog post from Canadian lawyer Barry Sookman, who had analyzed an Irish court decision on internet piracy. The entire 3,200 word article is included in the e-mail. Sookman did not respond to a request for comment.